This is more or less an assembly recipe that we will be repeating all summer! I came across this gnocchetti pasta in Foxtrot Market and thought it looked too great to pass up, but you can use any pasta you’d like. I recently bought a grill pan since we don’t have a grill and have been loving how easy it is— all the char has me dying for summer! 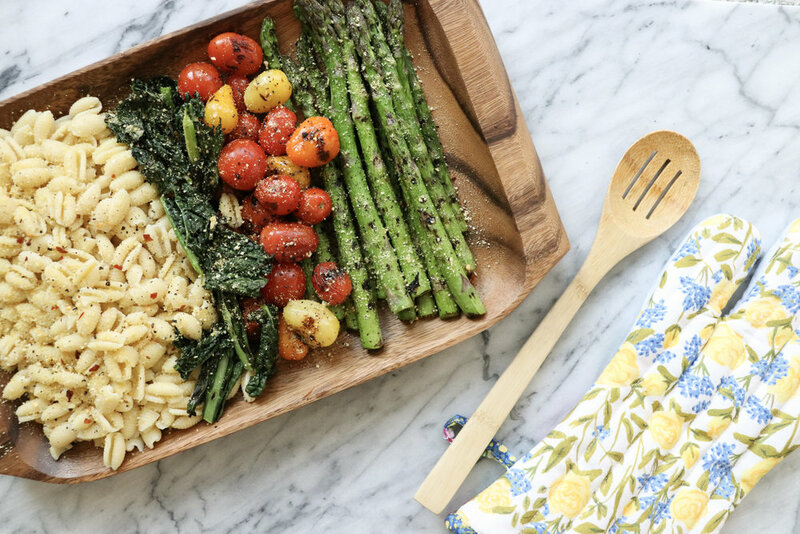 This grilled vegetable pasta is a new favorite because it is so easy to whip up quickly. It’s so refreshing and a lighter take on pasta! All you need to do for this, is toss the vegetables in olive oil, salt and pepper and grill them until they are charred on all sides. Prepare pasta according to package directions. I kept the pasta separate from the veggies as a build your own pasta style dinner! I did top all of it with our favorite homemade, 4 ingredient vegan parm, lemon zest, and the juice from half a lemon. 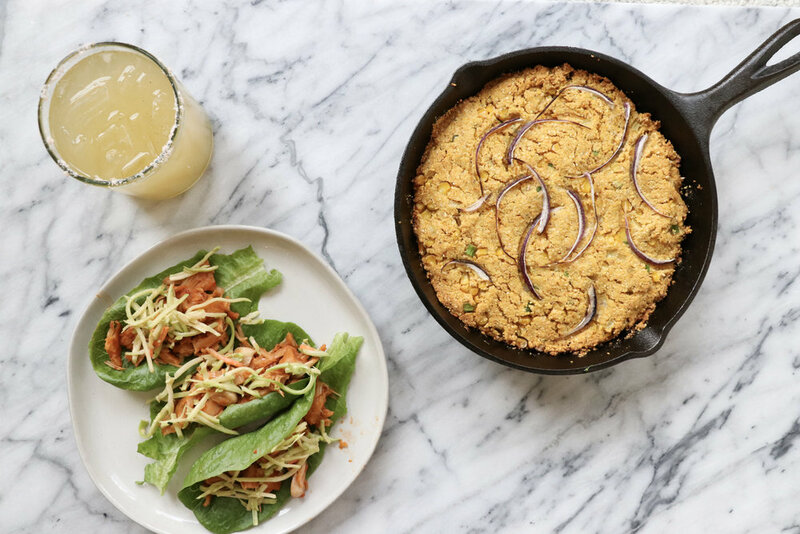 Another assembly recipe with the addition of a homemade corn bread from the Mississippi Vegan Cookbook! If I am keeping dinner as assembly friendly as possible, I do always like to add in a homemade element! I haven’t yet experimented with seasoning my own jackfruit because we love this brand so much. For the broccoli slaw, I bought a pre-shredded bag from Whole Foods and dressed it with 1/2 C Vegan Chipotle Mayo, 1 1/2 T Apple Cider Vinegar, and 1 1/12 T Honey (combine ingredients before tossing with slaw). I paired dinner with a Jalepeno-Kiwi-Cucumber Kombucha! Minimalist Baker is always so clutch for super easy and flavorful recipes. 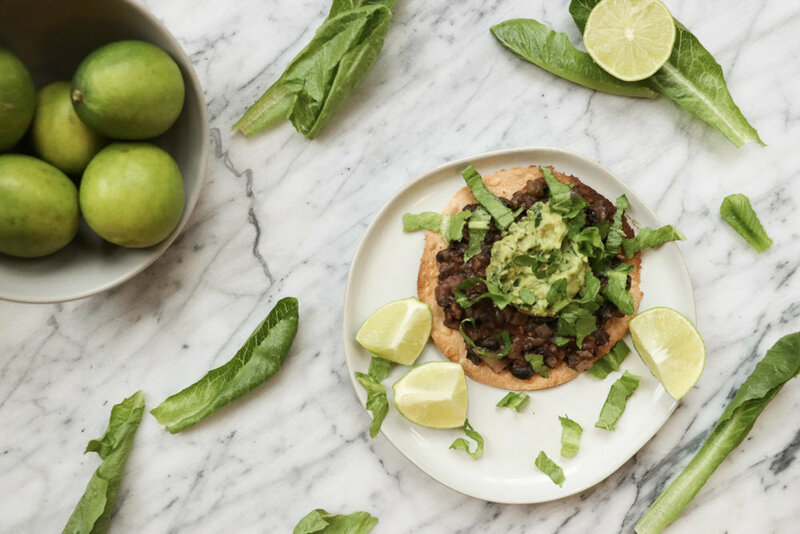 This black bean tostada is a take on her black bean enchiladas from her cookbook. Rolling the enchiladas is a little tedious for me when I’m trying to get dinner ready quickly while Isla is awake, so I always do tostadas with her filling instead. For the tostadas, I brush six tortillas with olive oil and bake at 400 degrees until they are golden (usually around ten minutes, but it depends on the tortillas you use, so keep an eye on them!). I make the black bean filling according to her recipe and add it to the tostadas when they come out of the oven and have cooled for a few minutes. Top with lettuce, guacamole, tomatoes, and serve with a lime! 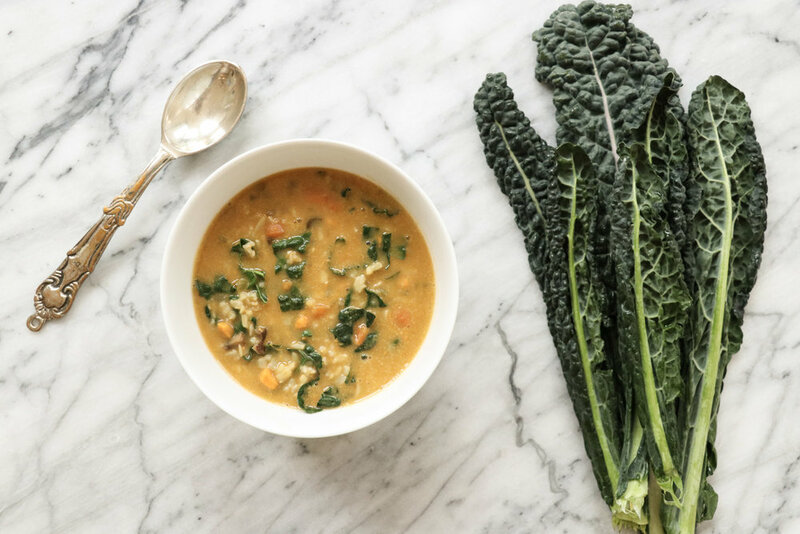 With a few 40 degree days still lingering around, this cozy Autumn Wild Rice Soup was the perfect soup to keep around for lunch! The recipe calls for Old Bay Seasoning, but I used ‘Seasoning Salt’ from Whole Foods which had nearly the same spice blend. We keep Isla’s salt intake really low, so instead of giving her a bowl of soup, I poured a tablespoon of the soup over steamed peas and sweet potatoes— she got the flavor but not too much salt! I also used low sodium vegetable broth, olive oil instead of butter, and made the soup on the stovetop instead of in the instantpot like the recipe says!